With mortgage rates at all-time lows, purchase and refinance activity is climbing. Home sales are at their highest levels since May 2010 as home buyers take advantage of favorable economic conditions. Home prices are low, household income is rising, and rents are up in many U.S. cities. Low rates have stoked mortgage refinance applications throughout Arizona , too. Last week, with 30-year fixed rate mortgage rates slipping to 3.36% nationwide, on average, more U.S. homeowners were in search of a refinance than during any one-week period since April 2009. With loan volume high, banks are nearing their respective capacities for underwriting and approving home loans. As a mortgage applicant, therefore, you’ll want to make sure that you’re taking whatever steps necessary to ensure that your home loan closes on-time, and without hassle. You most important responsibility? Be responsive to your lender. When asked for paperwork and/or supporting documentation, providing a 24-hour turnaround can keep your loan “top of mind” with your underwriter. This is important because underwriters are people and, sometimes, people “forget”. The fewer times that an underwriter has to “relearn” your file and its nuances, the better your chances for a speedy approval. A secondary benefit to being responsive to your lender is that you’ll be less likely to miss your rate lock deadline which, too often, is a costly proposition for a borrower. Even if the mortgage market has improved since your original lock date, your lender may assess rate-lock extension fees equal to up to one-half percent of your loan size. Disclose everything upfront. Your lender will find out anyway, so don’t under-disclose important facts. Be accessible. Your lender will often want to contact you by phone or email. Don’t lose days playing “phone tag”. When required, schedule your appraisal for as soon as possible. It’s easy to lose days to this part of the process. And, lastly, don’t challenge an underwriter’s request for “more paperwork”. Lenders want to see as little paper as possible. They don’t ask for information that’s not required to approve your loan. Mortgage volume is expected to remain high through the end of 2012 and into 2013. 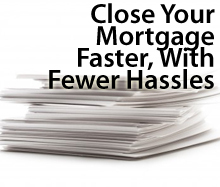 Follow these steps to help close your loan on time, and with few headaches.